The Plano 3620 has a perfect amount of storage for different hardbaits, softbaits, and terminal tackle. The Pro Latch Utility Box comes with 20 dividers to create anywhere from 4-24 separate storage areas. The Plano 3620 Utility box features fixed dividers that run along the long axis to enable you to fit longer accessories than the standard 3600 tackle box. This box features the Pro Latch, which means the latch is not molded with the box so it won't break off like the original design. Plano 3600 tackle box Dimensions: 11" x 7.25" x 1.75"
The Plano 3620 has a perfect amount of storage for different hardbaits, softbaits, and terminal tackle. The Pro Latch Utility Box comes with 20 dividers to create anywhere from 4-24 separate storage areas. The Plano 3620 Utility box features fixed dividers that run along the long axis to enable you to fit longer accessories than the standard 3600 tackle box. This box features the Pro Latch, which means the latch is not molded with the box so it won't break off like the original design. 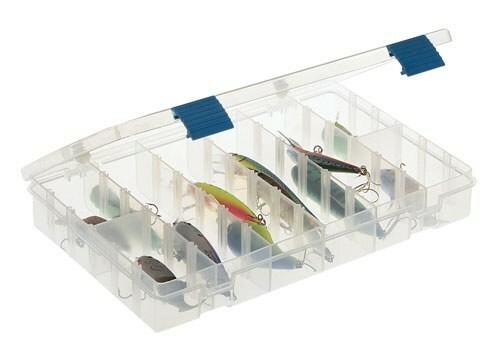 This box will fit any tackle storage system that utilizes the original Plano 3600 tackle box. Dimensions: 11" x 7.25" x 1.75"